Maine Landscape Architect Bruce John Riddell has created unique and timeless residential estate gardens and public parks in coastal Maine since 1994. Blending natural stone and native plants in a lyrical way, he creates the essence of pure gardens, comprised of plants, stone, water, air, soul and imagination. He artfully blends all of these through logical intuition, matching site, client, architecture and design elements in perfect unison. Bruce has been honored with national awards of recognition from the Perennial Plant Association in 2011 and 2012 as well as The American Horticultural Society in 2010. Over the years he has also received numerous merit awards from the Boston Society of Landscape Architects for his garden creations. His work showcases the bold contrast of natural materials with man-made elements, native plants with introduced species, natural raw stone and carved stone, color and texture, light and darkness. He transforms the blank canvasses of stripped construction into naturalistic landscapes with rich sweeps of native plantings and magnificent stonework. Riddell is also expert in the creation of site-specific garden furnishings including custom lighting, fencing, gates, arbors and fountains. His attention to detail unifies the design concept, from the groundwork, stonework and planting to the finest details, making his gardens one of a kind every time. In addition to designing and building dozens of private Maine estate gardens, Maine landscape architect Bruce John Riddell has been responsible for several notable public landscapes in Maine. As one the key designers at The Coastal Maine Botanical Gardens: Rhododendron Garden, Shoreland Garden, Hillside Garden, Meditation Garden, Rose Garden, Entry Garden, Kitchen Garden, Visitor Center, Event Lawn, Great Lawn, and Terrace Garden in Boothbay, Maine he has created a lasting legacy that will be enjoyed by generations of garden lovers for years to come. In addition to his Maine public garden works at the Coastal Maine Botanical Gardens, Bruce has designed and created The Charlotte Rhodes Memorial Park and Butterfly Garden in Southwest Harbor, Maine, The Veterans’ Park in Southwest Harbor, Maine and the Cliffside Site at Fort William’s Park and Arboretum in Cape Elizabeth, Maine and The Zorach Fountain in Bath, Maine. 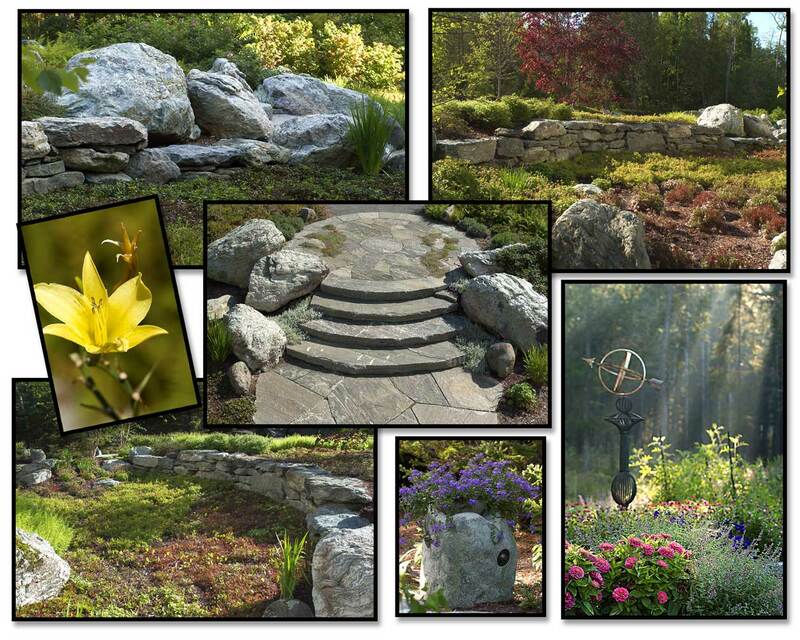 In all of these great Maine public gardens he has demonstrated his unique landscape design talents of melding stone and plant materials in an artistic and environmentally sensitive manner. Attention to site-specific details, refined methods and materials, and a deep commitment to sustainable construction and plant materials is Riddell’s hallmark of continual success. His mastery of stone in all design layers: from sculpture, paving, walls and natural boulder placement has won as much acclaim as his Beatrix Farrand-like English garden borders and his ever growing palette of native plants and moss garden creations. Bruce John Riddell transforms ordinary landscapes into extraordinary outdoor environments that are not only functional but aesthetically beautiful, timeless and spiritually uplifting. In 2010, the American Horticultural Society named Bruce John Riddell the Landscape Designer of the Year.